I got this new dress form in the mail yesterday! I'm pretty excited because now I can do actual pattern draping. These are the same forms we used in draping class. The shoulders are collapsible, the height is adjustable, and it's on casters. 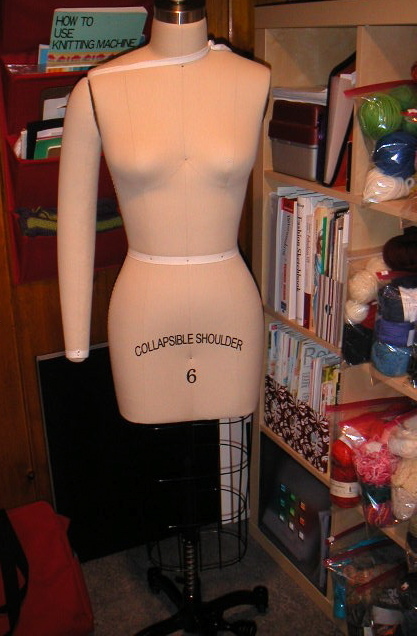 I have an older dress form, but it's really a mannequin; I can pin on it, but it doesn't have all the proper seam lines and such, so I decided that I needed to invest in a real dress form. I also got the arm for free as part of my purchase. I was looking to buy my form from Rox Studio, which has extremely reasonable prices for these kinds of forms, but then I found their eBay store. There were a couple of forms for sale and I made an offer and got it for a little less than the retail price on their website. PS Here's a great post on Fashion-Incubator regarding dress forms. This is for your information and is not intended as a spam post. You'll learn how I achieved #1 rankings for my websites in Google, Yahoo, and MSN. The program is absolutely free and it really works.